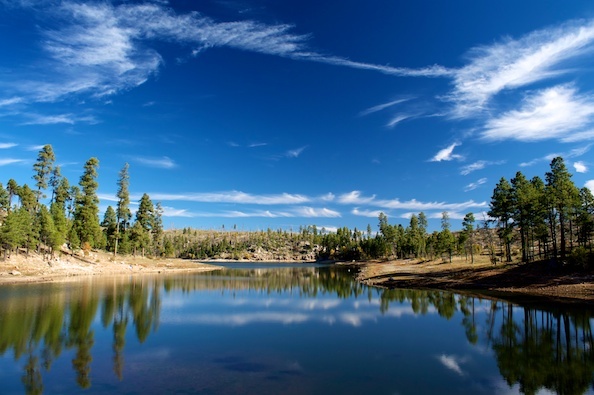 Black Canyon Lake is another in a series of lakes the Arizona Game and Fish Department built in the 1960s along the Mogollon Rim to provide water recreation opportunities for the public. Despite being affected by the 2002 Rodeo-Chediski Fire, Black Canyon Lake remains a popular and beautiful spot for picnics, camping and fishing. Because of the fire, the entire area around Black Canyon Lake is open for day use only due to the danger of falling trees. Location – Situated at 7,000 feet, the lake is located 15 miles southwest of Heber on the Apache-Sitgreaves National Forests. To access, turn south on Forest Road 300 from Highway 260. Drive 2.4 miles and turn east, or left, on Forest Road 86. Drive 3 miles further to the lake turnoff. Access is restricted in the winter when roads are closed due to snow, generally December to early April. Description – Black Canyon Lake has 78 surface acres, with a maximum depth of 60 feet and an average depth of 35 feet. Like other Rim lakes, Black Canyon is deep, and historically has been low in nutrients. Because of nutrients from the fire and ash, Black Canyon Lake is now managed as a put-and-grow fishery. The Department stocks fingerlings, sub-catchable and catchable-sized rainbow trout in the spring and early summer, with additional catchables stocked in the fall. The lake also currently contains illegally introduced green sunfish and largemouth bass. Although some trees around the lake are charred, the perimeter of the lake is forested and scenic. Fishing Techniques – Fly fishing from a boat or float tube is a good way to catch large numbers of fish at this lake. Use prince nymphs, peacock ladies, hare’s ear nymphs or black, brown or green wooly buggers. You’ll get good surface bites in the evenings using dry flies. Trolling spinners early or late in the day would be a good way to go after some of the larger trout. Bait fishing is best with night crawlers off the bottom. Kids can do well catching green sunfish using night crawlers under a bobber. Try this technique from the shoreline wherever there are rocks or other cover. 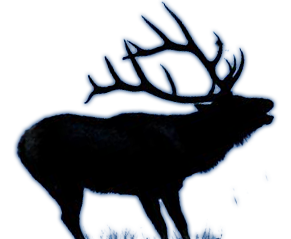 Special Notes – Statewide fishing regulations apply and a trout stamp is required. The daily bag limit is six trout, six bass and unlimited sunfish; three trout for unlicensed anglers under the age of 14. Boat motors are restricted to electric motors only.